Heartbeat rate means the number of heartbeats per unit time, usually expressed as beats per minute (bpm). The human heart pounds to pump oxygen rich blood to the muscles and carry cell waste products away from the tissues. Heartbeat rate can vary according to the demand of the muscles to absorb oxygen and excrete carbon dioxide changes such as during exercise or sleep. It also varies significantly between individuals based on age, fitness and genetics. This means that the heart must beat faster to deliver more oxygen rich blood. During exercise routines, the heartbeat rate gives a strong indication of how effective the exercise is to the body. The patient monitoring systems is one of the major improvements in the global health care program because of its advanced technology. A patient monitoring system measures the heartbeat and body temperature by using embedded technology. This advancement in technology is highly needed because many sick patients at the hospitals die because of high fever and heart attacks. The trend of cardiovascular disease has shown that heart beat rate plays a key role in determining the possibility of a heart attack while an increase in the body temperature can induce fever on a patient. Heart diseases such as heart attack, coronary heart disease, congestive heart failure, and congenital heart disease are the leading causes of death for men and women in many countries. Most of the time, the aged people of the society are more prone to heart disease problems than the younger ones. For people who live alone with no one to monitor their health condition, this device offers an opportunity to them for a constant monitoring of their health status, it is developed to monitor and alert the doctors about the heartbeat and temperature condition of a patient. It is developed to give patients a timely and proper healthcare. These days it is not easy for doctors and the nurses to remain close to a patients bed side to monitor their health condition. In the past, a huge and fixed monitoring device was used (only in the hospitals) to know the health status of a patient when on a bed. These monitoring devices are only available in the hospitals and are constantly on the patient’s body. Many of them are not user friendly so it is important that the doctors and family members will have a handy device that can always monitor their patients when they are not around. One of the vital things to monitor on a patient is the body temperature. This has to do with the measurement of the body’s ability to generate and get rid of heat. Temperature monitoring is one of chief indicators of the normal functioning of health. The nature of the human body is to keep its temperature within a narrow, safe range in spite of large variations in temperatures outside the body. Normal human body temperature depends upon the place in the body, from which the measurement is made, and the time and level of activity of the person. The typical body temperature is 37.0 °C ± 0.4°C (98.6 ° F ± 0.7°F). When the body temperature is high, the blood vessels within the skin expand (dilate) to carry the excess heat to the patients skin surface. One may begin to sweat, and as the sweat evaporates, it helps to cool his/her body. When one is too cold, the blood vessels narrows (contracts) so that blood flow to the skin is reduced to conserve body heat. This may cause an involuntary shivering in some people due to cold which is a rapid contraction of the muscles. This extra muscle activity helps to generate more heat. Under normal condition, thus keeping one’s body temperature within a narrow, safe range. Body temperature is regulated by neural feedback mechanism which operate primarily through the hypothalamus. The hypothalamus contains not only the control mechanisms, but also the key temperature sensors. Under control of these mechanisms, sweating begins almost precisely at a skin temperature of 37°C and increases rapidly as the skin temperature rises above this value. The heat production of the body under these conditions remains almost constant as the skin temperature rises. If the skin temperature drops below 37°C a variety of responses are initiated to conserve the heat in the body and to increase heat production. These includes: Vasoconstriction to decrease the flow of heat to the skin, Cessation of sweating, shivering to increase heat production in the muscles, Secretion of norepinephrine, epinephrine, and thyroxin to increase heat production. Another vital thing to monitor in a patient is the heartbeat rate. It is very important that the heartbeat is to be normal. That is 72 BPM. If there is any abnormality, then the patient is in distress. Heartbeat rate means the number of heartbeats per unit of time. The normal heartbeat rate of a resting person is about 70 bpm for adult males and 75 bpm for adult females. The average heartbeat per minute for 25-year old ranges between 140-170 beats per minute while for a 60-year old it is typically between 115-140 beats per minute and body temperature is 37 degree Celsius or 98.6 Fahrenheit. . Normally it is difficult to keep track of the abnormalities in the heartbeat count of by manual means. Patients are not well versed with the manual treatments, which the doctors normally use for tracking the count of the heartbeat. Thus, there must be some kind of device which would help patients and their family member to keep track of their health by themselves. This sole reason is why this project presents a heartbeat and temperature monitoring device using radio frequency (RF.). The concept of developing an RF. based patient monitoring device is to have a simple home and hospital based pulse and body temperature monitoring device for sick person’s that are in critical condition and needs to be constantly or periodically monitored by clinician or family. 1.2 WHAT IS A PATIENT HEARTBEAT AND TEMPERATURE MONITOR USING RF.? A patient heartbeat and temperature monitor using RF. is a radio frequency based pulse wave and body temperature monitoring system, which allows the control of a sick person’s condition in real time. The system monitors the heartbeat and temperature of a patient simultaneously and if the patient’s heartbeat rate or body temperature is abnormal, the system alerts sends an alert to the doctor or patient’s family members to quickly examine or diagnose the patient’s condition and take early precaution to save the patient’s life. The alerts sound can be triggered at any time as long as there is a deviation in the health condition of the patient from the normal, such that the status of the patient can be known on time. The system consists of a sensor, which monitors the patient and sends a signal to a microcontroller, which processes it to determine the temperature and heartbeat rate of the patient before sending an alert to a receiver using radio frequency. The receiver has to be in the possession of the patient’s doctor or family members. This project can also be used by athletes who engage in physical exercise and by medical professionals. Individuals, such as athletes, cyclists or those who are interested in monitoring their heartbeat rate and body temperature to gain maximum efficiency from their training can also use this project. It can be used during physical exercise and healthcare. The human health is one of the most important concerns in the world today. Anything/everything becomes meaningless when one becomes sick and dies due to improper Medicare. For health reasons, people, governments and several voluntary bodies spend a lot of money to ensure a better health condition for themselves and the entire populace. Scientists and Engineers are always at work to device a means of supporting/sustaining a sound health condition for all through the invention of numerous technologies both Electrical/Mechanical gadgets that are in use for health care delivery today. The heart is a very delicate organ in the human body (once it stops beating, nothing else matters). Thus, If early actions are taken (and on time) the heart condition can be managed effectively and many patients can be cured and saved. The problem of patients slumping and dying is associated with cardiovascular arrests and can be checkmated this sensitive and highly effective device (the patient heartbeat and temperature monitor). This device has an outstanding advantage that it is easy to handle and access. Heartbeat rate and body temperature monitors are part of the most vital tools needed in first aid kit for saving lives. Unlike the x-ray, the heartbeat and temperature monitor does not impose any hazard to the human health. There devices in the market which can provide raw measurement data of the patients to the doctors, but the patients may not be able to interpret the medical measurement into a meaningful diagnosis due to their limited medical background. On the other hand, if raw medical data is delivered to the doctor, time is wasted and may pose a problem, but in emergencies waste of time can never be tolerated. It is tough to share data over large area within a short period. Most of the products available in the market have this drawback of limitation in flexibility and portability. If the heat that is produced from metabolism cannot be checkmated on time, it will cause a turbulent body temperature, which could be worse than 40°C and lead to headache, vertigo, low blood pressure, high energy consumption, unconsciousness and crocking up of body temperature regulation function. On the other hand, when the produced heat is less than the dissipating heat, the body temperature cannot hold on and it will result to a decrease in metabolism. The major aim and objective of this design [of a patient heartbeat and temperature monitor using RF.] is to help the doctors and family members to keep track of the heartbeat condition of their loved ones [as well as their body temperature] in the case of an abnormality in the health condition (for those with heartbeat defects and those that run excessive high temperature beyond normal). If any varied change takes place, it is notified. This notification through RF. Channel would to take an appropriate action at an instance of time, thereby alerting the appropriate persons.. There are various instruments available in the hospitals to keep track of the internal body changes, but many of them have limitations regarding to maintenance, cost, size of instruments, and mobility. This project is so significant because it is mobile, small in size, cost effective, very easy to use, highly efficient performance, portable and light in weight etc. It uses RF. to help both the patient and the concerned doctor to take an appropriate action. It is beneficial in terms of cost. It saves time and is very helpful to patients who lives alone. It offers a freedom of movement to patients. It has a low power consumption though the stability of its wireless data communication is still to be enhanced. To some degree, the wireless data communication via RF has anti-jamming ability. This project operates at a 30 feet’s distance on open space. It is designed to operate with an alkaline battery of a minimum of 9 volts to a maximum of 12v consumes 50mA. It uses a buffer, temperature sensor, AT89c51 Microcontroller and a led display with buzzer for the alert. The hardware and soft ware of the system is oriented towards the AT89c51 single chip microcontroller. Hence, reducing the size of the device. A regulated 3.7v RF. operates in the frequency range of 415 MHZ per second used for data transmission, which can easily penetrate over three floors of a building and go over 30 feet’s in open space. The organization of the project report is well detailed and vast in its coverage. It covers all the activities encountered during the research work as shown in the block diagram below. The first chapter is the introductory chapter, which covers the background, project objectives, scope of the project, constraints and block diagram overview of the states. Chapter 2 presents the literature review. Chapter 3 covers the system analysis and design including the design methodology in block diagram form. 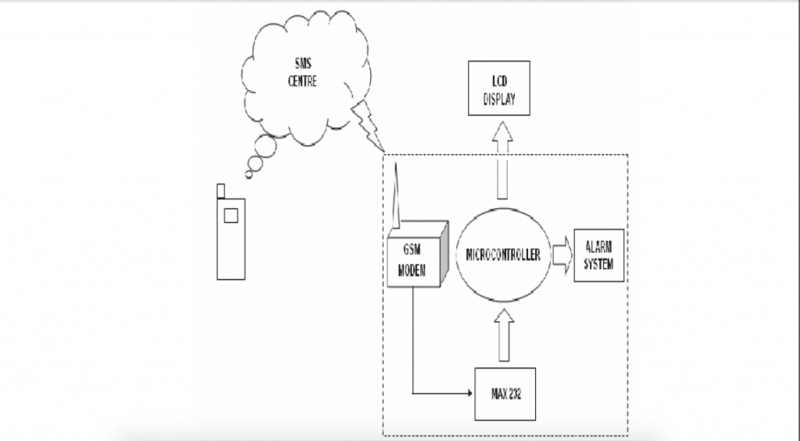 Chapter 4 presents the system implementation, which shows the component layout, the wiring schedule, the wiring diagram and the complete schematic diagram. Chapter 5 covers the testing and integration of the project design. The system testing was first carried out in a laboratory. Chapter 6 is the summary and conclusion, which includes the summary of achievements, problems encountered during project design, recommendation and suggestion for further improvement. Fig.1.2. Basic idea of a transmitter and receiver transmission using RF. With the aid of a simple, low cost microcontroller based heartbeat rate and temperature measuring device with LCD output. The heartbeat rate of a patient is measured from the index finger or the wrist or neck using IRD (infrared device) sensors and the rate is then averaged and displayed on a text board LCD. The device sounds an alarm when the heartbeat and body temperature exceed the safe threshold value. The programmer stipulates this threshold value at the time of programming of the microcontroller. The threshold value given for the device is between 20 to 120 pulses per minute for heart beat indication and 18 degrees Celsius to 38 degrees Celsius for temperature. Allen J. (2007): “Photoplethysmography and its application in clinical physiological measurement”, India, Wajal press Int. Brown .W.C. (2011): “The History of Transmission by Radio Waves,” Artech House press. Burke, E. (2010): “Precision Heart Rate Training, A self Guide”. International Conference, University of Toronto Canada. Prentice Hall. Debra .M. (2008): “Range of Heart Rates per Minute and Average Heart Rate for Various Ages”. http://www.smm.org/heart/lessons/lesson1.htm). Drinnan .M. J, Allen. J and Murray .A. (2001): “Relation between heart rate and pulse transit time during paced respiration”, Physiol. Meas. Electronic press. Gardiol .F. E. (2001): “Introduction to Microwaves”, Dedham Mass Inc.
Jeong. C. (2006): “A new method to estimate arterial blood pressure using Photoplethysmographic signal”, Platinum press. Mohammad .F. and Jamaluddin .B. (2008): “Wireless Heart Rate Monitor”, Teknology press. Mohd .F. O. (2011): “Developing a Heartbeat Monitoring System Using PIC Microcontroller”. Thesis B. KUiTTHO pub. Péter .C and Balázs .S. (2009): “Development and Applications of A Home Health Monitoring Device”, Kuala Lumpur, Kuncicky works. Sara .S. and Bill. Z. (2008): “Photo-plethysmograph”. IEEE International conference extract. Vol. MTT-32, pp.1230-1242. Shelley. K. H. and Stout .R. G., (2004): “The Use of Joint Time Frequency Analysis of the Pulse Oximeter Waveform to Measure The Respiratory Rate of Ventilated Patients.” Anesthesiology 91(3A): A583. Skolnik .M. I., (2010): “Introduction to RF. Systems Transmission”. McGraw- Hill Inc.